Do Re Media – Fostering community and sense of belonging: how social networks enable community. Fostering community and sense of belonging: how social networks enable community. 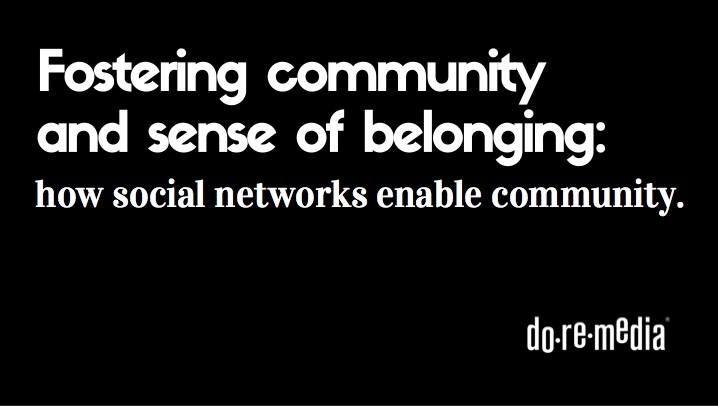 3 Comments on Fostering community and sense of belonging: how social networks enable community. Can you foster and feel a part of community online? How do social networks enable “community” within groups of online individuals? Throughout this paper I will argue that community is available to individuals via social networks and participants can experience a sense of belonging. Whilst social networks and online communities are not a substitute for the physical, social networks as we know them today, can act as tools to support and grow those that already exist. This is not to say that communities cannot be developed online initially, but it is the communities that are already established that I would like to explore in the parameters of my paper. This paper is directly related to Stream 2: Social Networks due to the discussion on networks and the part they play in cultivating sense of belonging and community in the online sphere of cyberspace. Whilst most examples are around Facebook, there are other networks not mentioned that also contribute to belonging and community including Twitter, LinkedIn and Alternate Reality Games (ARG’s). Community can be described as both people being in a similar geographical location as well as people having a particular interest or characteristic in common (Gusfield, 1975, p. xvi; Oxford Dictionary, n.d.). Due to the nature of online communities, it is the second definition that best describes the type of community this paper discusses herein. However it is not only having something in common with others that creates community, but the act of sharing that commonality that nurtures the feeling of community within participants. McMillan defines sense of community as “a feeling that members have of belonging, a feeling that members matter to one another and to the group, and a shared faith that members’ needs will be met through their commitment to be together,” (as cited in McMillan & Chavis, 1986, p 9). Social networks provide a platform and space for this shared faith, relationship and togetherness in turn creating community. Lambert et al. (2013, p. 1419) tie sense of belonging closely together with social relationships and finding meaning in life explaining that “having a meaningful life depends, at least in part, on a sense of belonging.” Both Thoits (1982) and Maslow (1954) agree that sense of belonging is a basic human need. If sense of belonging is so closely intertwined with the meaning of life and relationship, surely those social networks with the functions to enable individuals and groups to gather and share, could be used as a tool to further and better relationships both in cyberspace and in reality? The impression that life has meaning is important because those who feel life has meaning are more likely to be in good physical and mental health (Dean, 2013). Those with better physical and mental health are more likely to contribute and participate leading to higher social capital and so the circle continues. “As social beings, those who use the Net seek not only information but also companionship, social support and sense of belonging” (Wellman & Gulia, 1999, p. 6). Trust and identity are fundamental to the formation of online community (Donath, 1999, p. 1). In the offline world, we rely on a physical set of signals to determine whether or not we trust the individual or group in front of us. Since cyberspace is composed of information rather than matter (Donath, 1999, p. 1), users have adapted by relying on a different set of socially appropriate cues and signals, dependent on the social network being used and with varying degrees of reliability somewhat mimicking real life. Cues such as email addresses, domain names, written voice, language and signature styles can help with identity, revealing details about the writer. Burt (as cited in Donath & boyd, 2004, p. 2) discusses the cue of connection; that “knowing someone is connected to people one already knows and trusts, is one of the most basic ways of establishing trust”. boyd (2007, p. 13) agrees that people judge others based on their associations and Donath & boyd (2004, p. 3) add that public displays of connection are an implicit verification of identity. Facebook, Twitter and LinkedIn have included this function on their platforms. Once users are connected, they are then able to see what other users and interests they might have in common. In 2010, Facebook introduced a Groups feature whereby those with similar interests are able gather to share information. It is here that participants can share and galvanise their social identity, which is essential to the sense of community (Beniger, 1987, p. 352). Facebook Groups gives users the option of making the group private or open. Whoever initiates the group, becomes the administrator and ultimately decides if those that request to join are worthy of joining. Administrators also have to power to make others administrators. Groups can be used for a range of different users; families sharing their holiday snaps, university students working on group assignments, naturopaths collaborating on tricky patient issues, sporting groups sharing game timetables, results and strategies. Once trust is established between users, belonging and community ensue through shared information. If social capital is the value that social networks have, does that mean that social capital is both a driver and product of online community and sense of belonging? Coming together in a familiar, communal space, such as a Facebook Group or an online forum, can incite trust dependant of the space. Some spaces are monitored by admins or need verification to enter. Social networks can be likened to an online town hall; an easily accessible space and place where community members gather to share stories, collaborate, solve problems, gossip, share recipes, gather in times of celebration or mourning, create networks, keep in touch with their real-life friends and exchange information (Boyd, 2006, p. 11; Molyneaux et al., 2012, p. 10). Social networks online can mimic real life networks, only unlike a real life town hall, geographical, gender or race constraints do not exist. Offline social networks exist of co-workers, friends, relatives and acquaintances and not all need live in the same neighbourhood to be deemed a “community” (Wellman & Gulia, 1999, p. 2). The same could be said of an online community. Finding community online of like-minded people is accessible to anyone with a suitable device. Different levels of engagement among online social networks and participants also exist. Kim et al. (2007, p. 15) put them into the following four groups; devotees, active, casual (lurkers) and the curious. Whilst it is possible for lurkers and the curious to experience a sense of belonging, the focus here is on those who participate online. With the introduction of Web 2.0, Internet users transitioned from being simple consumers: read, watch, buy to participants: create, modify, discuss, share (Kaplan & Haenlein, 2010, p. 66; Kietzmann et al., 2011, p. 242; Kim et al., 2009, p. 2) and all from the comfort of their own home at their convenience (Wellman et al., 1996, p. 213). With this change came the introduction of the term User Generated Content (UGC) with examples such as Wikipedia, whereby it is the user who provides the information not just one entity. Users nowadays have access to a much boarder range of opportunities to participate online. From signing petitions (www.change.org) to reviewing restaurants (www.urbanspoon.com), crowdfunding projects (www.pozzible.com) to crowdsourced camping databases (www.wikicamps.com.au). In February 2015, a Perth council decided a local food caravan, Cool Breeze Café, could no longer operate due to a clause in policy. Owner Giorgia Johnson took her concern to Facebook and then started a petition online at www.charge.org. Around 2000 signatures (Pilat, 2015) were collected both online and offline with the end result being the council changing their decision and the caravan being able to continue business as usual. Without the participation of community online, the outcome for the offline community would have been different. By participating in something online, offline rules are changed and people are affected in a real life, tangible sense. Some might see it as just a caravan in a park, but placemaking is at the very heart of it. After the council changed their mind, the sense of community had changed. When ordering a coffee, customers talked about the win they had with the owner and with each other. Something they had participated collaboratively online to achieve an offline goal. A sense of achievement was evident as well as a sense of awareness of others in the community working towards a common goal. So why participate? What does an individual get out of posting a hotel review from their holiday or signing a petition for the local cafe? The Act, Belong, Commit campaign (2011) suggests we define ourselves through memberships and involvement in community. Donath (1999, p. 31) argues that motivation to participate is centred around “building reputation and establishing one’s online identity”. Why build reputation? The answer to this question points us back to the notion of trust, altruism, contributing to the greater good and fostering greater social capital (Veenhof et. al. as cited in Molyneaux et al., 2012, p. 4). Imagine if you could strengthen offline community using social media by creating greater sense of belonging through participation. How would this work? Using suitable platforms to share and display participation breaks down barriers, namely geographical and time constraints. In this case, a group of creatives in Rockingham decided to gather both online and in person and document their day-to-day experiences of their suburb and surrounds (https://instagram.com/secretsinthebay). Not only are they creating a public space online to share and participate with each other, but they are also nurturing their sense of belonging and sense of place offline through sharing something they have created together, like being in on a communal secret. This social capital or glue that holds them together is also then available to others through contribution. The perfect example of a social network being used as a tool to further and better relationships both in cyberspace and in reality. Despite the opinion of some, real community and sense of belonging can be found and nurtured online through participation, collaboration, storytelling and exchange of information. By building trust and identity through user generated information and building on social cues learnt from the real world, users are able to navigate their way to healthy community and essential sense of belonging. Until trust is established, users do need to approach social networks with the same caution they might when entering an unknown venue, group of people or new country. The ever-changing nature of online social networks and online platforms mirrors the offline world and should be used to foster community and sense of belonging through sharing and participation. There will always be isolationist views assuming social networks cause social isolation just as critics came forward in the 1970’s with the introduction of telephone services and television. But used in a healthy way, social networks can enhance community and be used as a tool to strengthen relationships both online and offline.